I came across Fentimans when someone mentioned their Victorian Lemonade to me. The local supplier that I found didn’t have the Victorian Lemonade when I went in, but they did have the Shandy (and some of their other flavors), so I grabbed a four-pack to try. Upon reading the label (and confirming by looking up the definition of ‘shandy’), I saw that it was a mix of beer and lemonade. 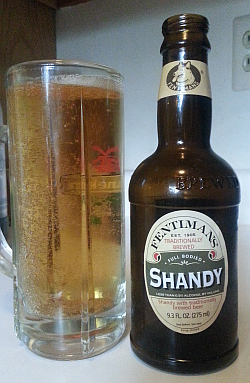 In the case of Fentimans, the 70% beer has been de-alcoholized to 1° proof or less. I was nevertheless dubious, recalling my personal history with beer. The bottle is the typical brown glass that many beers are sold in, and unlike the generally clear bottles that most sodas are sold in (there are exceptions). Upon opening the bottle, I was met with the distinct odor of beer, which is certainly expectable, but did nothing to assuage my doubts. On pouring into a glass stein, it developed a head much like beer would, though not nearly as long-lasting (but definitely not ‘soda foam’). The color of the shandy is the same sort of amber color one expects from the typical American mass-market lager. The flavor of this product is definitely affected by temperature. When I originally tried this, not wanting to be surprised immediately before writing this review, I had it quite cold from the refrigerator. Then, the lemonade flavor was quite pronounced, and it wasn’t ‘beery’ at all, except perhaps a little as it hit the back of the throat on the way down. When drunk closer to room-temperature (in this case, it sat on the table in the bottle for a couple of minutes while I took pictures, then a minute or so more while I dug out my glass stein, then a minute or so more after pouring while I did a visual inspection and took a picture for the second paragraph of this entry), the beer-ness comes forward much more strongly, though it doesn’t get to the point of overwhelming the lemonade. Edited to add: The carbonation was visible, with myriad small bubble forming on the inside of the stein, and a distinct fizziness on the tongue. It was not a strong carbonation like is common in commercial seltzers, but neither was it the barely-there carbonation of Boylan’s MASH. Overall, it gave a pleasant mouth feel. I won’t presume to try to make a pronouncement as to whether the beer flavor is ‘good’ or ‘bad’; I’m not a beer drinker, and my experiences and expectations aren’t those of someone who knows beer. However, taken as an entity by itself, I’d occasionally seek this out, just because I needed a change from the same-old-same-old. I do think it would go well with crunchy salty snacks, or with something like chili con carne. My preference would be for colder, but I can see where this could legitimately be considered ‘better’ when served at or near room-temperature. Sold as four-packs of 9.3oz (275 ml) bottles. ETA: I found this at a nearby Fairway supermarket. That shandy does sound nice I'll keep an eye out for it in my local bottle shops. OK, I'll have to try this. I miss beer, and if it's ~1% alcohol, it should be better than other stuff. 1° proof is actually 0.5% alcohol, not 1%. I should also emphasize that it really is a mix of beer (sans alcohol) and lemonade, and note that quite a number of my friends who are more discriminating about beer than I am ever likely to be say that "if you've got to mix fruit flavors with your beer, you shouldn't be drinking that beer". Also, remember that I'm looking at this as soda, not as a beer replacement. That said, I'm not telling you to avoid it; I'm just suggesting that you consider the source and temper your expectations. I need to cut back on soda, because of the nasty chemicals, and HFCS. I dislike the taste of near-beer because of the lack of bite, and drinking soda or beer at the firehouse or at a party simply becomes a challenge in renal processing and continence. The acid in the lemonade might replace the lack of bite in near-beer, and fill out the flavor more. I've not come across their shandy, but I rather like their ginger beer. I wonder how much difference there'll be between sodas brewed in UK and NA. The only way to be certain, obviously, is to try both... which can become an expensive proposition. I'm the one that raved about the Victorian Lemonade, which is still my favorite by far. I love Fentimans, which is saying a lot given how much I hate anything carbonated. Yup, my memory's not that bad (yet), but I'll generally keep information about other people private, especially if it's not directly relevant to the entry.